FOLLY: A little while ago Nosa and I were having a conversation with a gentleman about which restaurant in Lagos he thought was the best, his response was Talindo. After this review, I'm inclined to agree with him. I've always thought that 1415 was the best restaurant in Lagos because they deliver great food and exceptional service. The thing is Talindo also does that too, great food and exceptional service, but at a lower price point albeit in a less nice environment. NOSA: The price is really what took me by surprise at Talindo. I didn't expect it to be so...cheap. And is it really a less nice environment? FOLLY: Talindo is "tight" compared to 1415, but then again 1415 is in the lobby and I have a thing against "fine dining in the lobby". FOLLY: Our starters were simple, we had the coconut prawns and the involtini di carne. 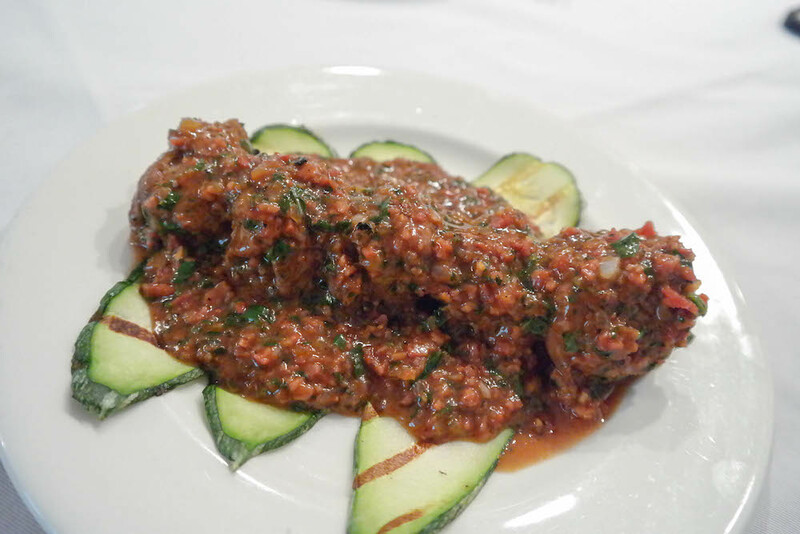 The coconut prawns were as the name implies, the involtini di carne, however, is meat stuffed with zucchini in the most delicious chunky garlicky sauce that Nosa couldn't stop drinking. NOSA: That thing was delicious, please, imagine eating with rice and stop fronting. FOLLY: The coconut prawns were decent. I was disappointed that they gave us tiny shrimp, I feel as though these should have been made with larger prawns. The quality of the prawns/shrimps just felt disingenuous to me. NOSA: The coconut shrimp could've been a lot better. Not taste wise, but I expected some more, a larger portion, maybe. FOLLY: On the taste, the coconut is not in any way overwhelming. It's actually a secondary taste that comes after you've bitten into the shrimp. All steak-ed out from the previous day's escapades, Nosa and I opted to split the ribeye and a pasta dish. Small mistake I made was to order the meat to Nosa's specification which is medium rare, I usually go a little north of that with medium. 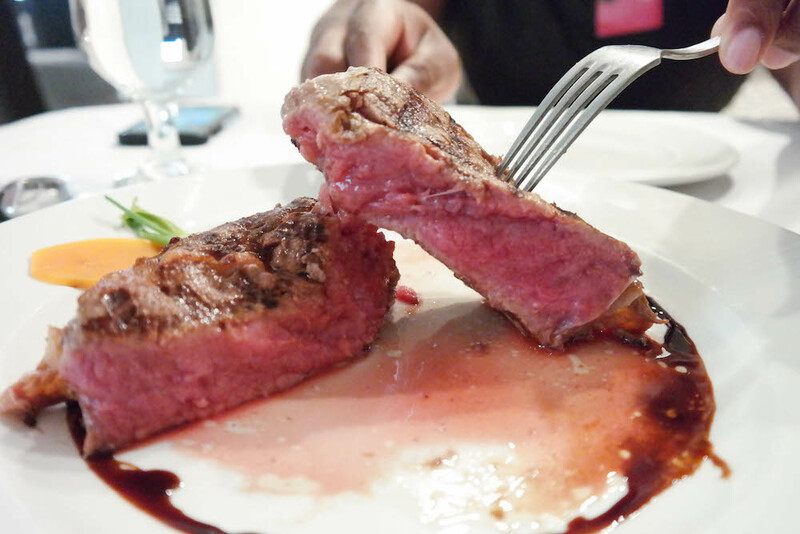 NOSA: Probably the best decision you made because the steak was so bloody good. Tender, juicy, with a little chew, and some pink in the middle. Absolutely perfect. I knew Talindo had great steaks but I didn't expect to be so blown away by the rib eye. FOLLY: I chose the rib eye because no other cut of meat has the amount of fat that a rib eye does, and I felt that'll contribute to the flavor. Talindo gave us a very generous 350g of meat and this baby was thick. Sadly, I couldn't really enjoy the steak because it was a bit too rare for me but I had a few bites. NOSA: Probably because you didn't get a steak knife. Don't blame the meat. FOLLY: Yes, that's definitely why. I didn't like the pinkness of the steak because I didn't have a steak knife. Makes perfect sense. The meat itself didn't disappoint me, I just couldn't eat much of it on account of the rareness. NOSA: For our pasta, we got the Penne Pesto. FOLLY: The color of the pesto initially threw me off because I'm used to it being a lot lighter in color. Notwithstanding the color, it was a delicious pesto pasta. The pesto was rich and thick and pine nuts were toasted and had a nice bite to them. The penne was also a perfect al dente. NOSA: The penne actually surprised me. I'd have let Talindo slide if the pasta was rubbish considering it's not their forte, but they surprisingly exceeded expectations. Oh, and it's low-key wallet friendly. FOLLY: Best brownie in Lagos and I loved that it's served on a hot plate. Dessert is often overlooked in Nigerian restaurants so I love that Talindo put some pizzaz into the presentation. Also, it's a real brownie and not vanilla cake with Bournvita. NOSA: This is definitely the most snapchat friendly dessert in Lagos. If you weren't already washed by Talindo, the brownie will definitely push you over. FOLLY: Talindo is great for date night and other similar private intimate dinners. NOSA: For a place so good, I'm surprised Talindo isn't fully booked every night. Best steak in Lagos...easy. Limited parking inside, but street parking is also available.